Home > Heavy Duty V Belts > V-Belts. A, B, and C Sections. Standard and Kelvar Construction > Classical B Section 21/32 inch (.66") Wide. Classical V-Belts. > B142 Classic V-Belt. BANDO POWER KING V-BELTS: B Section. 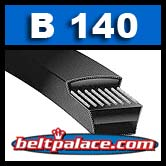 B-142 > B140 Industrial V-Belt (HI - POWER II) 143" Length, 0.66" Wide Power Ace V-BELT. B140 Industrial V-Belt. 143" Length, 0.66" Wide Power Ace V-BELT. B140 Industrial V-Belt (HI - POWER II) 143" Length, 0.66" Wide Power Ace V-BELT. Replaces: Dayton 6L218 (Grainger), Dayco/Gates/Goodyear B-140.